The salesperson who says you’ll get feline aids and a year of bad hair days if you live at community X is only thinking about the short term gain – which is actually illusory. Maybe you believe them, but that doesn’t mean you like their community any better. If anything, you’re naturally put off as we generally dislike people who crap all over others. What’s to say they’re not going to do the same to us the second we leave? Build a good reputation for honesty. Tell them the reasons why you do what you do, and what you believe in as an organization. State where you’re better than X and where you’re not and trust them to see the value you’ve worked so hard to build. That’s all the difference you need to stand out. Our new in-house, Marketing-Strike-Force-of-Awesomeness have been laying siege to the plain vanilla world of the tired & trite student housing adverts of old. Ben & Jerry themselves have trembled under the audacious show of flavor perpetrated by these skilled ninja-confectioners-of-imagination. Calling themselves the Triple Threat, these three complimentary legs of the tripod are the razor’s edge of our marketing outreach to our; 2500+ Residents, future clients, and the rest of the Orlando market. So, seeing as how they go into the field plain-clothes style for the bulk of their media making, we decided they’d benefit from press passes – as that’s what they are in so many ways. Lanyards made sense since they could be easily slipped on, so I told them to go ahead and whip up something for themselves. Fabricio Torres makes some of the most amazingly shot and edited videos you’ve seen, and he does it with blazing speed. We can conceive, shoot, edit and upload timely content in a matter of a couple of days where before it would have taken weeks. Chantell Cruz took these photos and a ton of amazing shots for our Resident events and advertisements. She’s a true artist behind the lens and we couldn’t be more impressed with her ability to capture it all, from the sublime to the stolen moment. Danae McDermott designed these passes and all of our graphics for flyers, ads, Resident announcements, and anything else we may put out. She’s insanely talented with Adobe Suites and can crank out a professional design in no time. I was beyond blown away by the quality and the personal expression they put into these passes. They’re conversation starters for sure and show that we don’t take ourselves too seriously. The rest of the team liked them so much they’ve been spoiling for their own. Ultimately, I can’t say no. Special thanks to our very own Gregory Eisenberg for finding such a remarkable team, bringing them together, and letting them do what they do best. I couldn’t be prouder or more excited to work with such a stellar cast. Advertising is more often than not, about interrupting people. A lot of it is imitating what someone else has done and what other ads look like for that same type of product or service. There’s a straight and narrow path and plenty of people that would prefer to walk down it. For them, it’s not about connecting with people, it’s about being safe. Making meaningful, original, honest work that aims to connect the brand/team with the client isn’t high on that list of motivations. If asked, they’d answer that they’d love to connect with people, and many may believe that their benign work is doing just that. I’m in the business of housing college students, so being relate-able scores major points with our customers. In addition, our students have grown up with the internet since birth – and having ads thrown at them through every medium their entire lives is a constant. Originality goes a long way towards breaking through their defenses. Honesty has immense value. I saw the following two flyers on ebaumsworld.com and immediately fell in love. 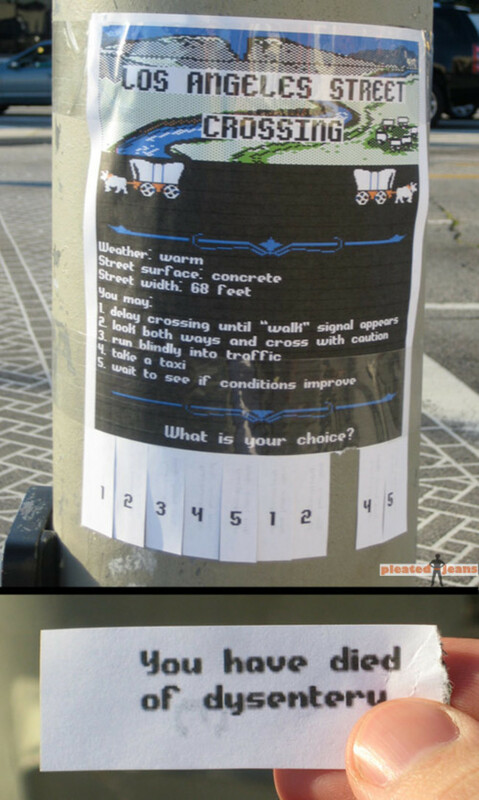 If you’re anything like me, you LOVED Oregon Trail as a kid. There’s an immediate emotional connection, coupled with the unexpected and the humorous. I’m hooked. I’m connected. Granted, it’s not advertising anything, but imagine a little logo in the corner and this posted at your property’s crosswalk across from campus? It’s enough to highlight the sense of you humor of your team, and to show that you’re human. The next is a little rougher around the edges as far as language is concerned, so if you’re easily offended by light cursing, might I suggest skipping this one. Caroline, please edit this blog for $15 an hour. Probably without realizing it, Caroline totally nails the bulk of the Six principles of Dan & Chip Heath’s best seller, “Made to Stick” which I wrote about in the past. 2. Unexpected: You didn’t expect this, and certainly not with the cat picture. 3. Concrete: Caroline. Edits. Papers. Got it? 4. Credible: There’s a decent sample of her writing, so you could argue she’s credible, though her target customer wouldn’t know that for sure. 5. Emotional: She’s funny! By stating bluntly what she’s thinking she makes an emotional connection to her audience – especially the type that’s likely to purchase her services. 6. Stories: She tells one for sure. She even gives example of exchanges she’s likely to have with you. Essentially, the Heath brothers analyzed all kinds of messages to find out which ones stuck with people and which didn’t – and what qualities they possessed. 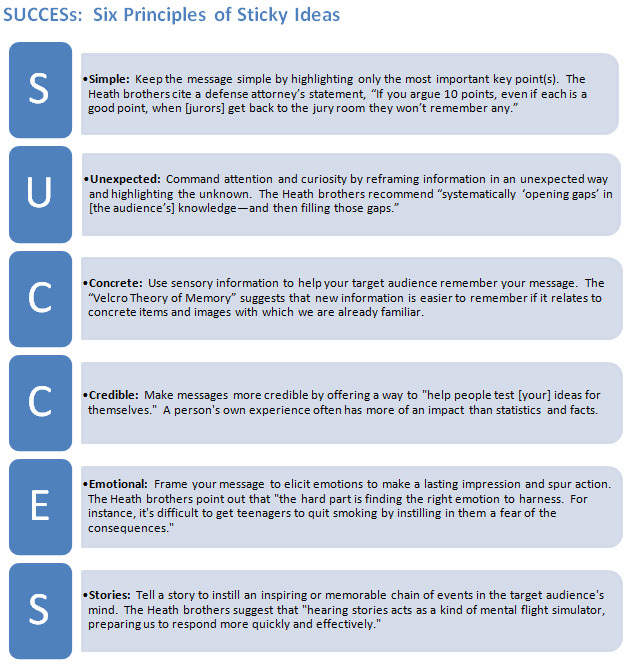 You don’t need all six apparently for a compelling message, but the more the better. Caroline is almost perfect here. If asked weeks later, you could tell that; Caroline edits papers, won’t do so after 9pm because her meds wear off then, and that it’ll run you $15 and hour. 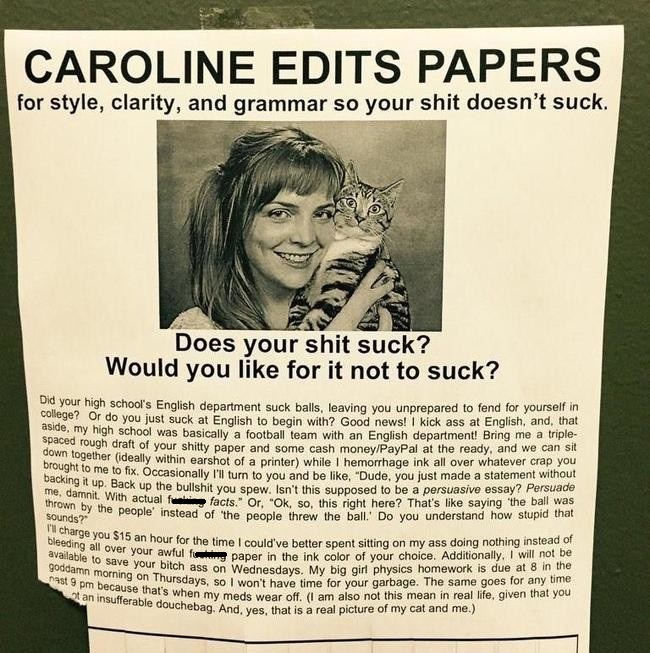 What would you have told Caroline if she’d made these for you and wanted to place them around campus, but YOU owned the editing service? Would you have said it’s too risky? That you’d prefer something a little safer? Maybe just straightforward – “editing services, $15/hour, call Caroline.” You could have, but then you wouldn’t have nearly 2.5 million views on imgur. Understood, this doesn’t work everywhere and for everything. We’re not going to run the same style ad here, but the lesson is important – take away the reasons why it works and apply to your own marketing and advertising. Resist the urge to play it too safe next time. Aim to make a connection and get your message to stick! Yeah, it sounds like a mouthful, but you get it. With 2500+ bedrooms, anything we can do to make mundane tasks faster is a life saver, so we’re always looking for ways to make our lives easier (see our Mission Statement post). Below is a sample shot of a feature I added to our Excel Turn board where we’ve loaded the last replacement date for every carpet in the community and it will give us a bill-back amount we should charge the previous resident (if at all) when we schedule a new replacement. Just enter the new replacement date and voila! We track our current carpet on a five year life span, but I’ve seen commercial grade products that may have a 7-8 life span. The cool part is we can change the total calculations by manipulating the price we pay for carpet up top on the page, or the life span if we switch to a stronger carpet and it will adjust all future calculations. Cool, right? The other exciting aspect of this is we’re far more guaranteed to insure we’re properly charging back for this common loss and we can cross reference the totals for carpet bill-backs from our turn board with our budget’s actual charges to insure we didn’t miss anything. Total build time was around three hours and another 2-3 hours of inputting the last known carpet replacement dates for each unit. Note: this was made slightly easier than usual as the entire property got new carpets during renovations in 2011, so not every single unit needed data input, we just assumed 2011 unless we’d had an invoice since then.